Allowing one's self to be captured is an act of "surrender." These are all very good athletes. The drops being shown here are short. Most of these folks are nimble enough to come down these drops "hot" without consequence, but to do so over and over again, person after person.... and a sprained or broken foot or ankle is inevitable. A one in a hundred...or even a one thousand chance, done a thousand times leads to someone's number being up. Note that hand lines are used to help, if you are not last. And dragging pack helps the last one, if needed. But most important is to note the body position of those being captured. Lined up, vertically centered and using maximum friction on the rock. Most important is that the knees are straight. A bent knee, on someone coming in, reduces friction and makes the capture many times more difficult. The pushing in on shins, knees, thighs is what allows people to "bring in" someone MUCH bigger than themselves. You have to trust your partners bringing you in. We all like to climb and scramble about, but where applicable and safest, the "Art of the Capture" is very rewarding and promotes group bonding. It also saves time and is less impacting as no anchors need building. What does it look like when someone 6'7" captures somebody 6'7"? Ali Miller, ratagonia, LonePeak and 4 others like this. Ram, Tom Collins and Kuenn like this. 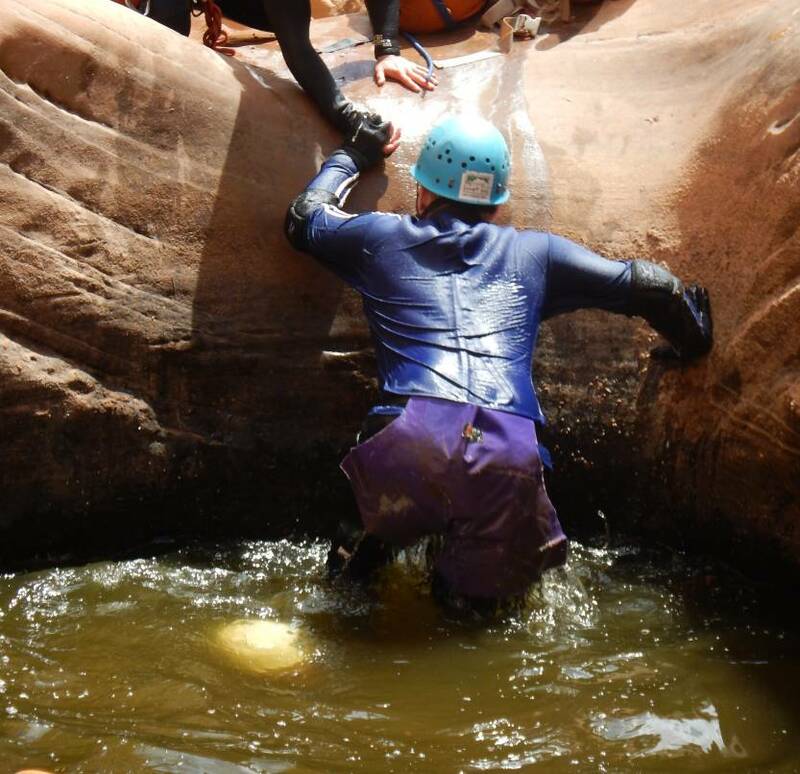 I was lucky enough in my early canyon days to hook up with a guy whose philosophy was when you get to a drop you don't look for an anchor, you look for a way to downclimb/partner assist, no matter how difficult/high it might be. Sometimes if it even looked like it might go he would start down it (carefully of course) and see. If he got stuck (which was rare) he'd ask me to drop a line, but only then. Of course he was my height so I knew that once he made it down I could as well so I learned quickly that a lot of places that most people rap could actually be downclimbed with a little thought and care. Ram and Rapterman like this. Downward Bound, LonePeak, John Styrnol and 2 others like this. hlscowboy and Rapterman like this. Once two are out we switch to the "two person haul"
LonePeak and Scott Chandler like this. Ali Miller, Ram, Canyonero and 4 others like this. Quite the cross section of tights. Pictish, Ram and LonePeak like this. Ali Miller and Ram like this. I thought rule # 1 was "You can wear anything you want in a canyon because it's going to be thrown away at the end anyway." I think this thread needs that picture of me doing the underwater shoulder stand, what do you say @BaJenkins? Don't you have that picture? Ram and BaJenkins like this. Here it is @Canyonero. Your famous white helmet is glowing just below the surface. Jenny, Brian in SLC, Kenmoto and 5 others like this. That's the one. That was a heckuva escape for the first person out. It looks like you've already got a couple of people out in this pic, why continue to do a shoulder stand and not have the people already out haul up the rest of those in the pothole? You caught us. It's just for the picture. But it wasn't for the first one and really the second out. Gotcha, I've done one or two of those as well, fortunately I was never the guy on the bottom. Wow, this is an incredible thread! ratagonia, Kuenn and Bootboy like this. I used this idea in Egypt 1 once. It does work really well for these short drops that are just a little too long to slide. Derrick Snider and Ram like this.